Over the past two or three weeks, I've started pinning home decor on pinterest. A part of me loves being nosey and seeing how other people decorate a space and make a 'house a home' but also I find it very calming to sit with my laptop in the evening and just pin everything I love or find interesting. I'm sometimes a forgetful person in terms of I go to google with an idea in my head and then I see 'Google' and suddenly forget what I was going to search, so pinterest is brilliant for keeping ideas in one place so I don't forget anything. 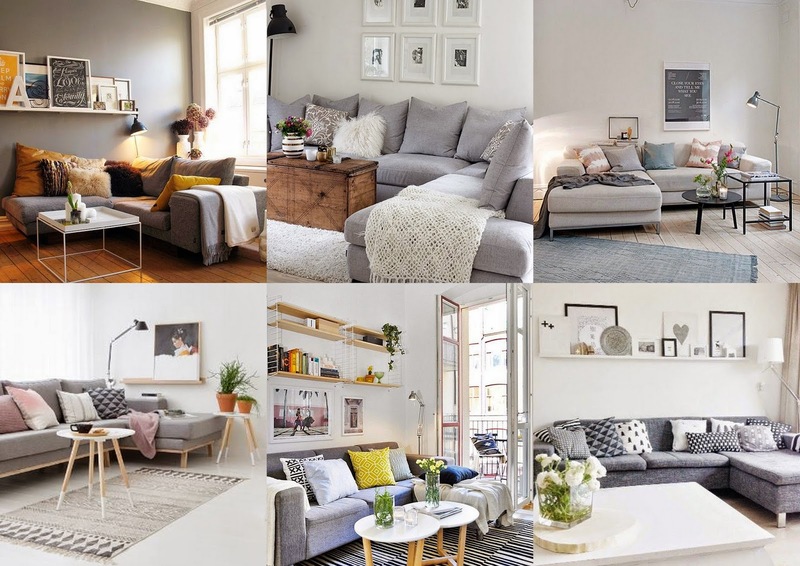 Something that has really caught my eye when looking at living room decor is definitely a big grey sofa. There's just something about them, I can't quite put my finger on it but wow I just can't stop pinning anything that's got a grey sofa in it! I think it's the fact that you can add different colours to grey to make it brighter yet it just looks gorgeous with a wooden table and a few picture frames behind it. I'm absolutely in love. If you want to see more of me on pinterest, you can follow me here. What do you love in your living room?